Do you know the new MongoDB tool which lets you analyze your data, the structure of your collections in a visual manner without having to write down commands? Its name is Compass and it is available for you now! At the same time we can assign a name to the connection. In a column at the left of the window, there is a list of our favorite connections and also the more recent ones. This allows us a faster connection without filling in the form. When the form is filled in we click the CONNECT button and the access is very fast. Just below we have a search box, useful when we have a large number of databases and/or collections. Finally, there is a list of our databases and collections alphabetically ordered. As we can see, we already have the fundamental data about the collection. We have a text box where, if necessary, we can write a query for analyzing the data we are interested in through the APPLY button. If we want to go back to the first full data analysis we can use the RESET button. One of the most powerful characteristics of this tool is that we can use it whitout the need of write any command, we can use it only with the mouse. 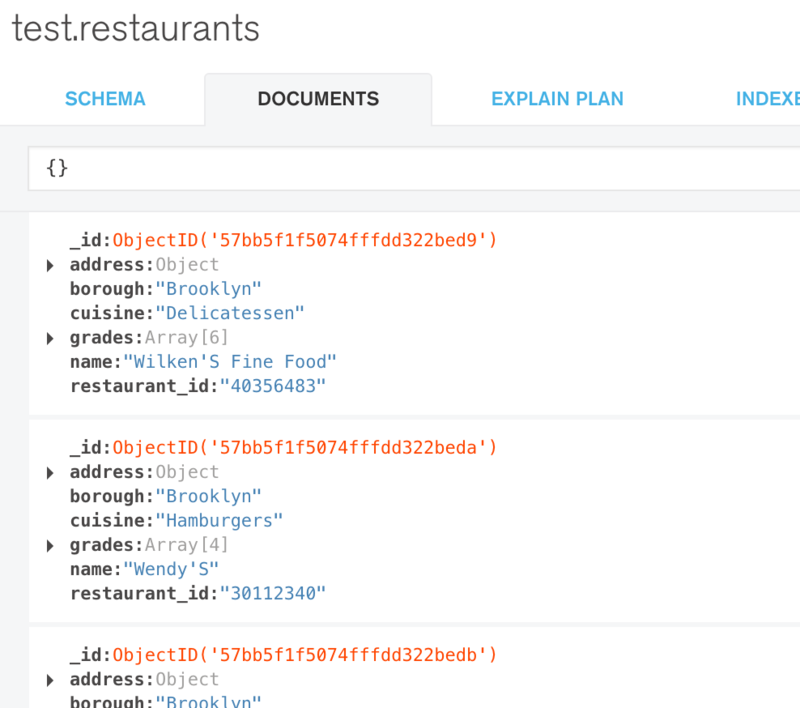 By the way, we can always view how Compass automatically constructs the query for us when we select a range of our data. This allows the use of the tool by those people without knowledge of the MongoDB query syntax. The number of documents returned by the query is the first information we obtain. If this is greater than 1.000 (in my case) the report will be constructed with 1.000 documents randomly selected. We already have the information related to all of the collection’s fields, with its data type, or types. Also, we have the percentage of each data type of the field. If the field has embedded fields we can see them clicking on it. At the right of each field we have very useful graphics describing the data stored in it, even geographycal coordinates. With the mouse we can select/limit the range of data we want to make the report. We can see how the query is built automatically as we limit the range. Also, we can see information of the data simply moving the mouse over the graphic. In this section we can explore the documents returned by the query. Of course, also the embedded fields. And also, the information of the query planner, with the winning and rejected plans, execution statistics and even about the host. I think this is a very useful tool for developers, for DBA’s, for newbies and also for experts. Everybody will get the most of it making tasks in a fast way and with zero commands at the shell. 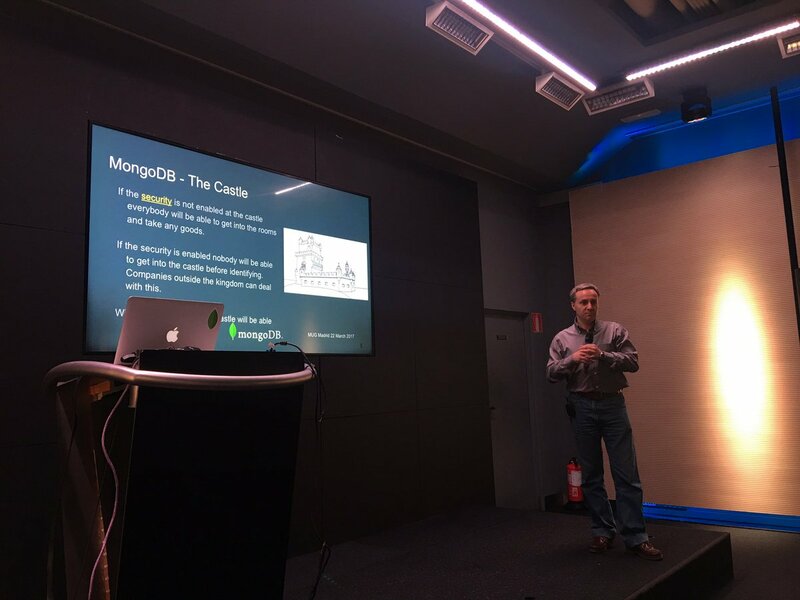 MongoDB will add new characteristics soon. Thank you very much for reading, I wish you have enjoyed Compass and you will use it. Use the following information to complete this form, but do not click “Connect” yet. Hostname is cluster0-shard-00-00-jxeqq.mongodb.net. Username is m001-student. Password is m001-mongodb-basics. Click “Add to Favorites” so that you can easily connect to our class MongoDB deployment after closing and restarting Compass at some point in the future. 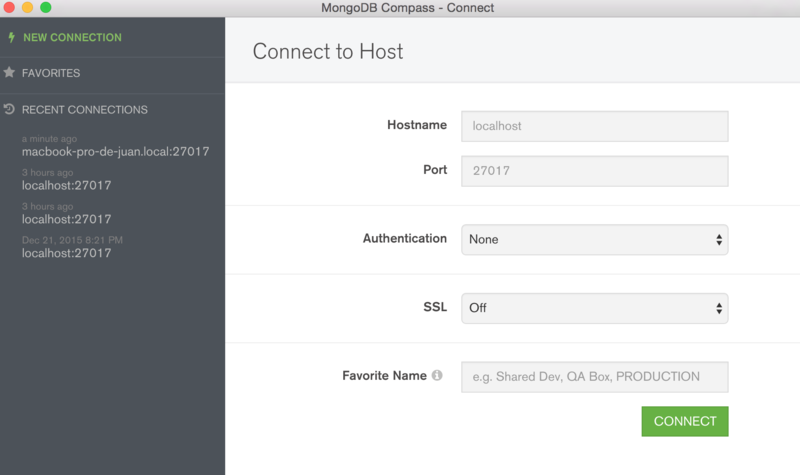 Now, click “Connect” and load the databases in the M001 class MongoDB deployment.